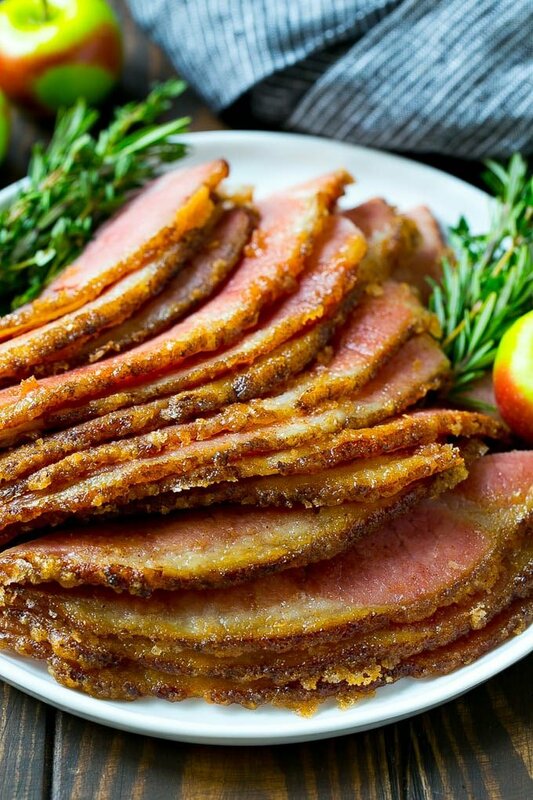 This honey baked ham recipe is a copycat of the super popular HoneyBaked Ham Store version. It’s a tender ham baked to perfection and coated in a crispy spiced sugar glaze. The ultimate holiday ham! 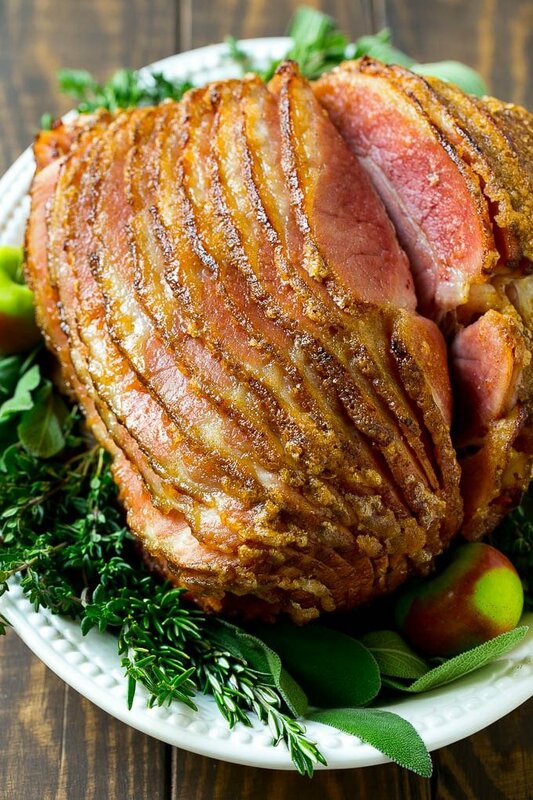 When I think of the holidays, I think of honey baked ham. 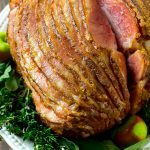 My version costs a fraction of what you would pay if you went to the HoneyBaked Ham Store, but it tastes just as delicious and is actually quite easy to make. Serve your ham with loaded mashed potatoes and glazed carrots for a complete meal. It’s not a holiday without a honey baked ham. I used to frequent the HoneyBaked Ham Store to get one of their delicious and decadent hams for the major holidays. Then I discovered just how easy it is to make a honey baked ham at home. Now I skip the store and make my own and it gets rave reviews at a fraction of the cost! How do you make a honey baked ham? 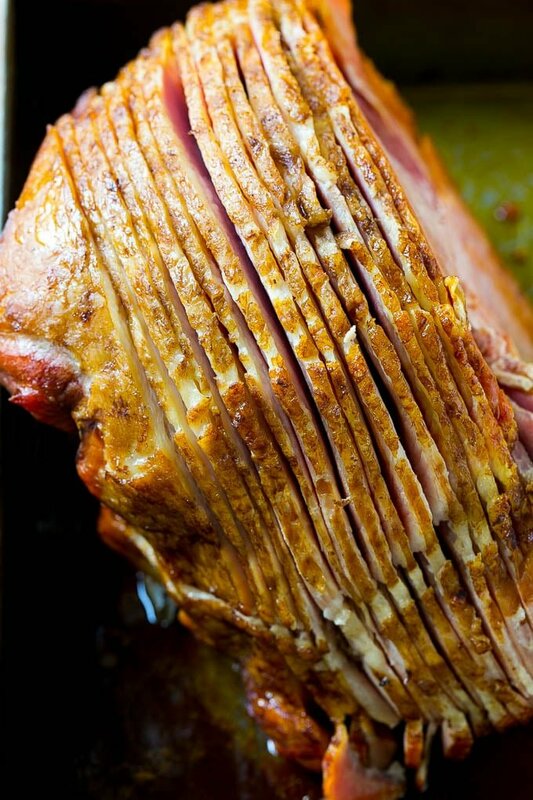 The first step is to drizzle honey over a spiral cut ham and bake it in the oven. After the ham has been heated through, a spiced sugar topping gets slathered over the top and is then broiled to get that signature sugar crunch glaze. How do you bake a ham? I put my ham face down in a baking pan, drizzle it with honey, then cover the whole pan with foil. This helps to ensure that the ham won’t dry out in the oven. Bake your ham at 350 degrees F for 10 minutes per pound. The ham is ready when a thermometer inserted into the thickest part of the ham registers 140 degrees F.
After your ham is cooked, it’s time to make the glaze. The glaze is a mixture of sugar, spices, and the drippings from the ham pan. 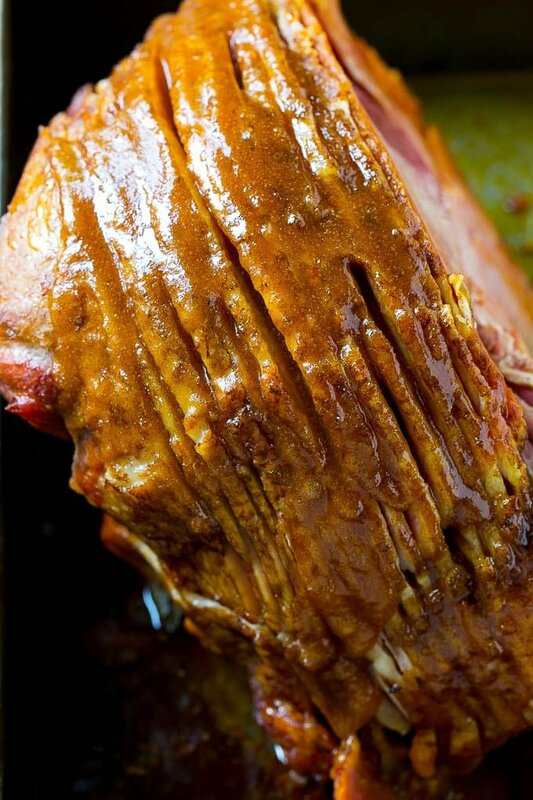 The glaze needs to boil for exactly one minute – do not overcook the glaze or it will completely harden when you put it on your ham. You’ll want to turn your ham so that the spiral cut side is up to make sure the glaze gets into every nook and cranny. The final step is to broil the glazed ham to get those amazing crispy sugar coated slices like a store bought HoneyBaked Ham. You’ll want to watch carefully to make sure your ham doesn’t start to burn. Be sure to separate the slices after you broil the ham, as the glaze will harden a bit as it cools and you’ll want to be able to cut individual slices. What do you serve with ham? However you serve your ham, it’s sure to be a huge hit with your family and friends. No one needs to know how easy it was to make! 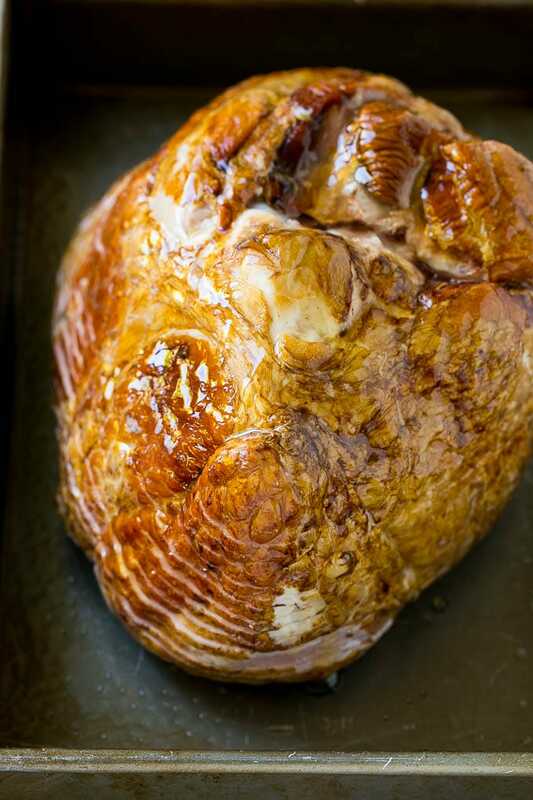 This honey baked ham recipe is a copycat of the super popular HoneyBaked Ham Store version. 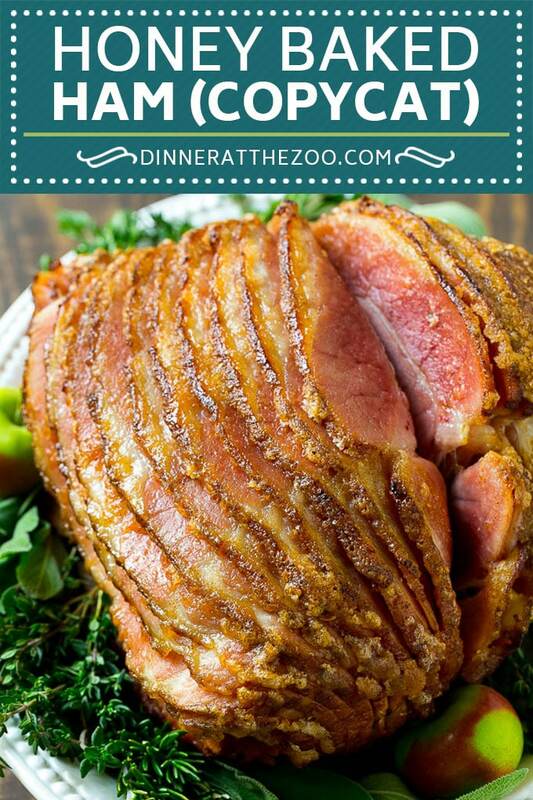 It's a tender ham baked to perfection and coated in a crispy spiced sugar glaze. The ultimate holiday ham! Preheat the oven to 350 degrees F. Coat a 9" x 13" pan with cooking spray. Place the ham cut side down in the pan and pour the honey over the top. Cover the pan with foil. Bake for 2 hours or until a thermometer inserted into the ham registers 140 degrees F. Remove the ham from the oven and preheat the broiler. Place the sugar, onion powder, cinnamon, nutmeg, ginger, cloves and smoked paprika in a medium sized pan along with 1/2 cup of drippings from the pan or water. Stir to combine the sugar and liquid then bring to a boil. Boil for exactly one minute. Pour half the glaze over the ham and place the ham under the broiler. Broil for 1-2 minutes or until glaze starts bubbling. Remove the ham from the oven and pour the remaining glaze over the ham. Broil for 1-2 minutes more. Remove the ham from the oven and separate the slices. Transfer the ham to a platter and serve, garnished with herbs if desired. The last time I made this the ham was so so salty that it just ruined the taste. Any suggestions? I would try a different brand of ham, because the salt level definitely varies from different manufacturers. You can also try rinsing your ham under cool water, then patting it dry to remove any excess salt. Ive made this ham recipe a few times now and it always comes out amazing! Love this recipe! That should work fine, just keep a close eye on it so that it doesn’t burn! The ham turned out delicious and will be making this one again. I have made extra spice mix to have on hand. I made this yesterday for Christmas dinner but ran out of regular sugar so I used one cup of regular sugar and one cup of brown sugar. Everything else was the same. it was delicious. My husband has been picking at the ham all day today that’s how I know it was a hit. Thanks for the recipe. I can’t wait to make it again.